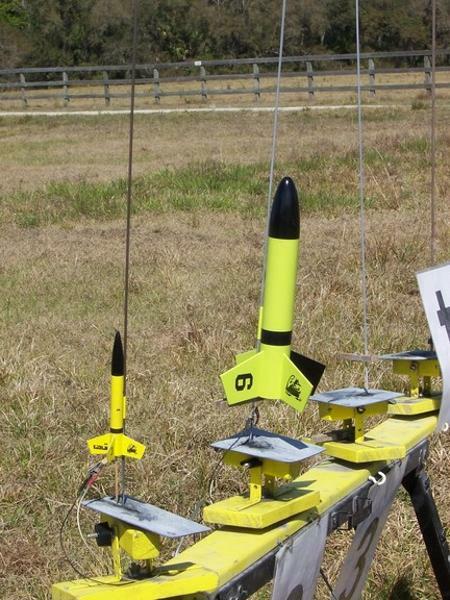 Essence's Model Rocketry Reviews is pleased to announce a new photo contest. This contest also serves as a bonus item for the 2009 EMRR Challenge, but it is not necessary to participate in the Challenge to participate in this contest... but, why wouldn't you? Winners will be judged by EMRR Guests during a voting week of October 4 - 10, 2009. The "write-up" need only be basic information of what "inspired" the rocket. It would be nice to know what it flies on, altitude, recovery and success (or not) information too! Contest is over on 10/1/2009. Online Voting will take place from 10/11 - 10/21. 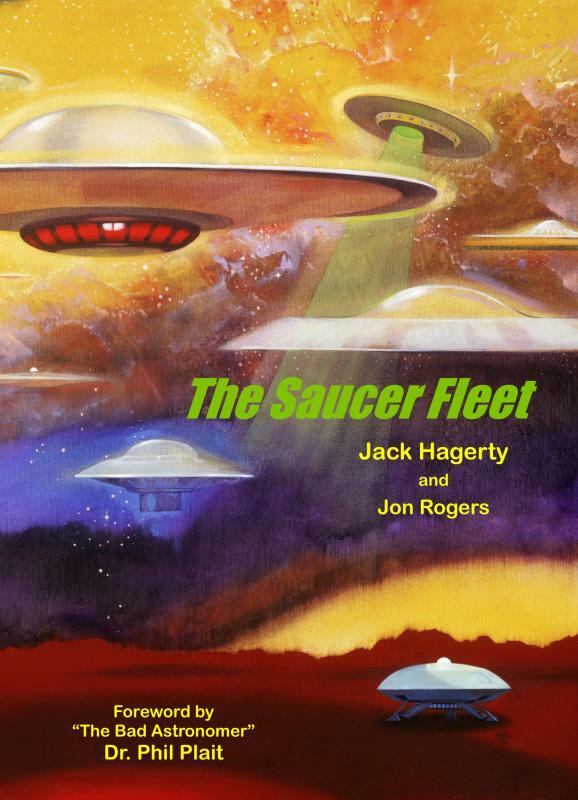 ARA Press This book examines the social phenomenon of flying saucers through the lens of the films and other media of the day. You won't find any chapters on Area 51, Roswell or almond-eyed Grays here. What you will find is a detailed and meticulously researched reference on some of the most popular science fiction films of all time. 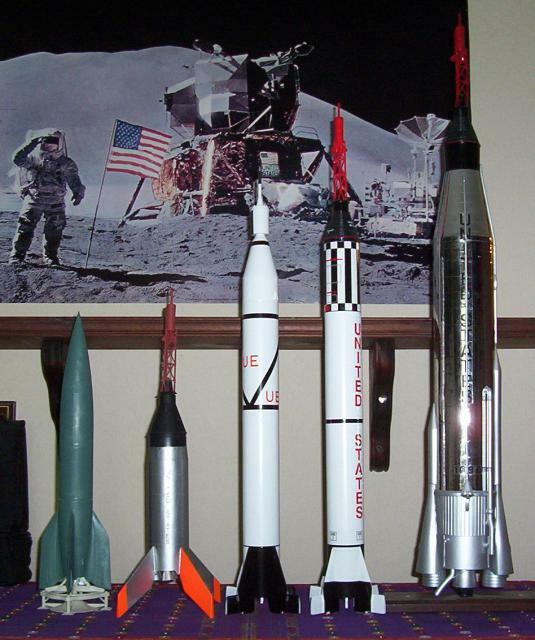 I like scale models, especially those from the 1960s (with a special fondness for the Saturn 1B and Saturn V). I think it is particularly interesting to assemble 'same scale' families to show the progression over the years. 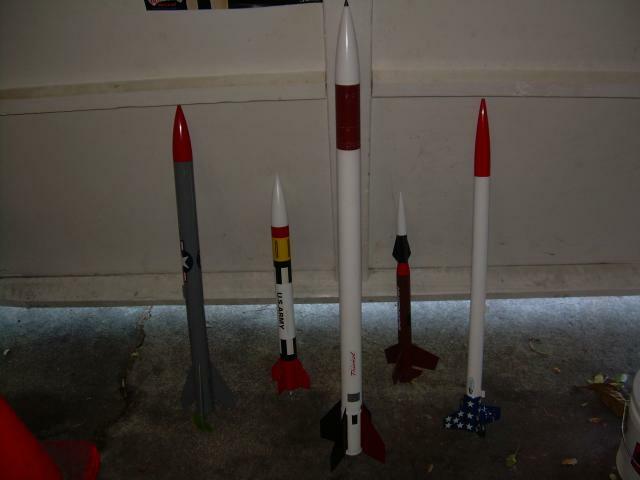 The 1/100th Scale Family (above left) - all 1/100th scale models of 1959 - 1960s vintage rockets. 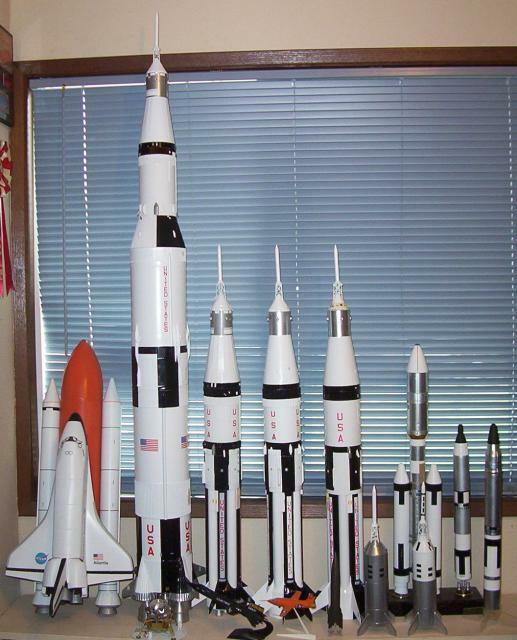 This is my favorite 'family' as it shows the dramatic progression from the Jupiter C to the Saturn V in less than 10 years. It is kept 'on display' on my bedroom dresser, with that Apollo 11 poster in the background. 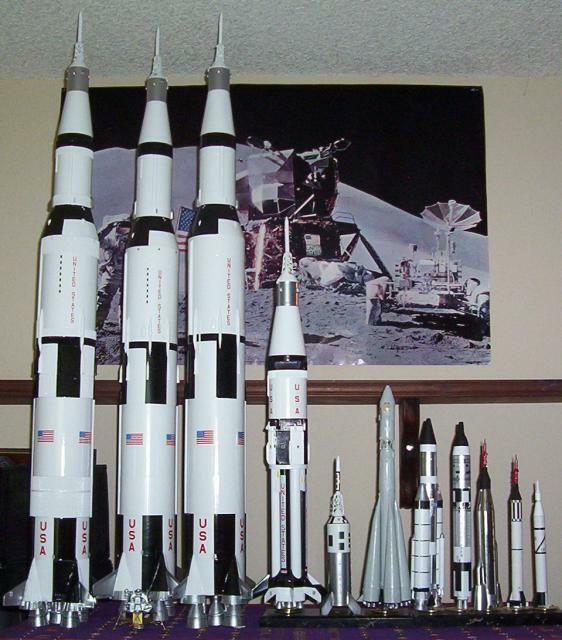 From right to left (small too large): Nuebauer Jupiter C, Nuebauer Mercury Redstone, Nuebauer Mercury Atlas, Nuebauer Gemini Titan, MPC Titan IIIC, MPC Vostok, Estes EST 0892 Little Joe II, Estes EST 2048 Saturn 1B, Estes K-35 Saturn V, Estes EST 2001 Saturn V, and Estes EST 2156. In the foreground in front of the middle Saturn V is a plastic model LEM. None of these have actually flow, but with the obvious exception of the LEM model all were built to be flight capable, and I have versions of all but the Titan IIIC that have flown. The 1/70th Scale Family (above right) - all scale models, varying in scale between 1/70th and 1/73rd (close enough unless you start measuring stuff). This collection is on display in my 'office'. 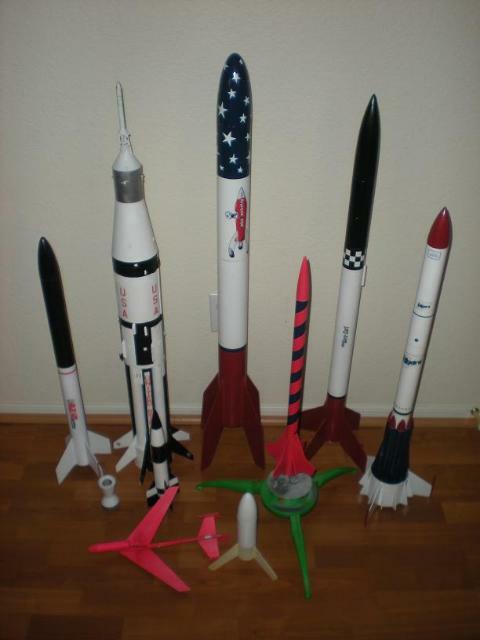 From left to right: North Coast Space Shuttle, Apogee Saturn V, Apogee Saturn 1B, Estes K-29 Saturn 1B (started in 1972, finished 30 years later with an Apogee Apollo capsule and vacuform wraps when the originals could not be located), Estes K-29 Saturn 1B 'original', Estes EST 2019 Titan IIIE, Estes EST 1978 Gemini Titan, Estes EST 1918 Titan II. 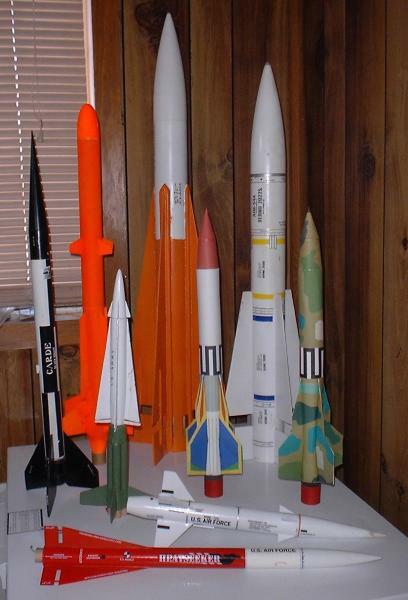 Across the front are plastic models of the LEM, X-15, and X-1, a Semroc clone of the Estes K-30 Little Joe II, and my clone of the K-30 Little Joe II using an Apogee capsule. 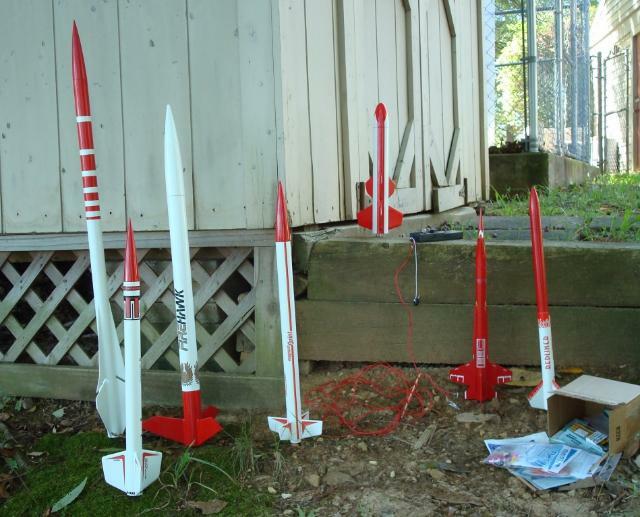 Aside from the plastic models all are flight worthy, the Apogee Saturn V, Apogee Saturn 1B, Estes Saturn 1B with plastic wraps, and my Little Joe II clone have all flown. I'd planned to fly the North Coast Space Shuttle when I was building it, but when it was finished I realized the chance of safe recovery of the Shuttle was minimal so it was grounded. (2) 1x @ 1/2" dia.- the Estes kit. Partially built (2) 1/2x scale with MMX motors not shown. Used wood glue for the 1x & 2x versions. Used epoxy for all other versions. No fiberglass. TTW construction for 5.5x, 6x & 8x versions. Homemade decals. 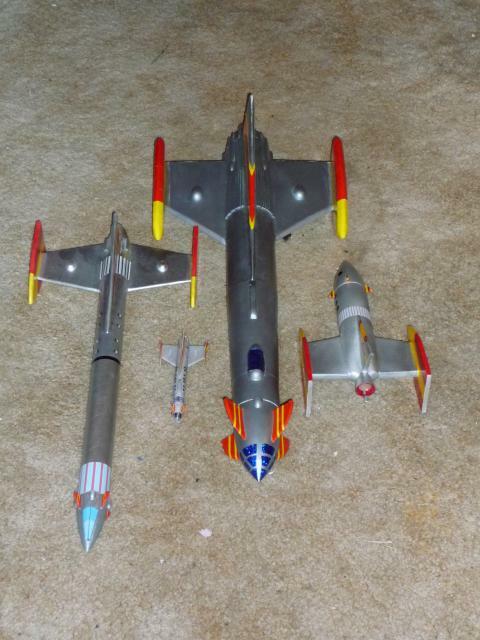 Here is my mini fleet of Fireball XL5 models. The scratch-built 'papa' flies nicely on 29mm motors and the 'mama' is my Deuce XL5, which is a kitbash of the FlisKits Deuces Wild!. 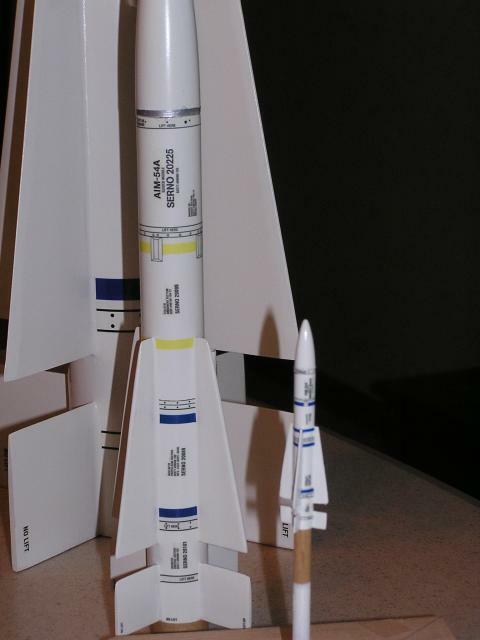 A paper model converted for Micromaxx is the 'baby' of the family. I recently added the 'weird uncle' that they don't like talking about. He's just too 'goony', being bashed from an Estes SS1 kit. Three of these have been reviewed, and the weird uncle is awaiting a flight test. 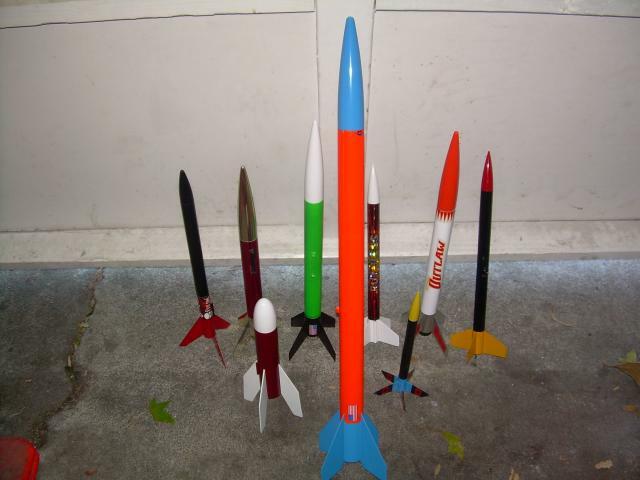 - Papa: Fireball XL5 Mama: Deuce XL5 Baby: Matchhead XL5. I have always been fascinated by Bomarcs. Something about the rocket/plane combination has made them a favorite modeling subject of mine for many years. 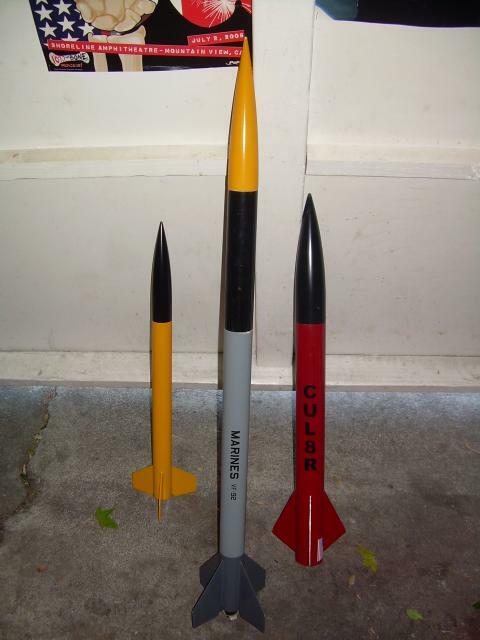 These three Bomarcs were built for a rocket display at a plastic model show. 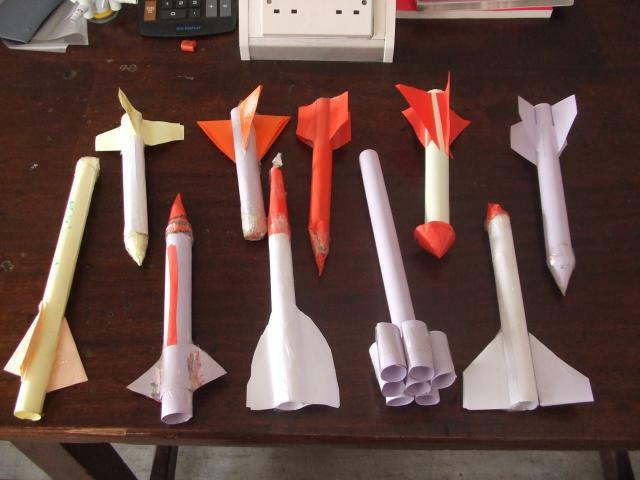 The idea was to show the difference in size of rockets built to fly on different motors. 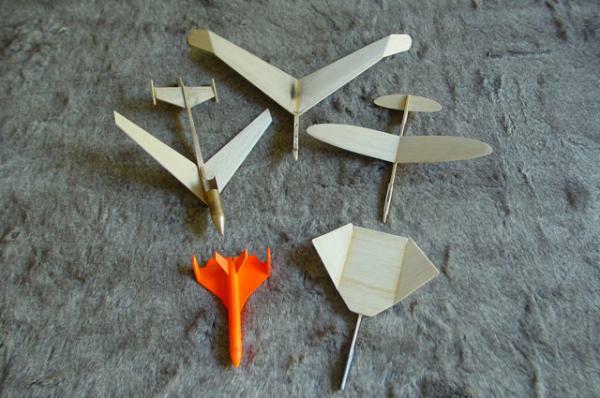 The smallest is a Balsa Machining Services repro kit of the Estes Mini-Bomarc, which uses, naturally, mini-engines. 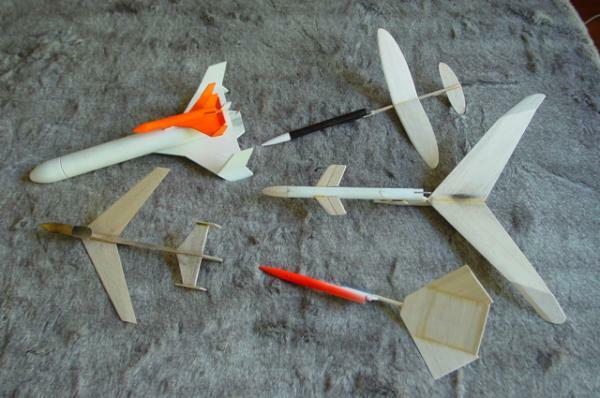 The mid-sized Bomarc is a Scratch-built "D" powered boost glider, based on Estes kit from the 70's. 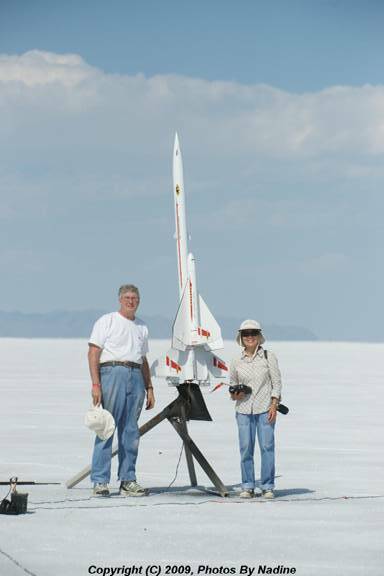 The largest Bomarc is the "G" powered kit from Mad Cow Rocketry. All three were completed this year. Now I am waiting for the opportunity to fly them when the Local NAR range opens up this fall. Since Bomarcs can be a bit squirrelly, I want to be sure I have plenty of room to set these off. This is a photo of a few of my military-type models. 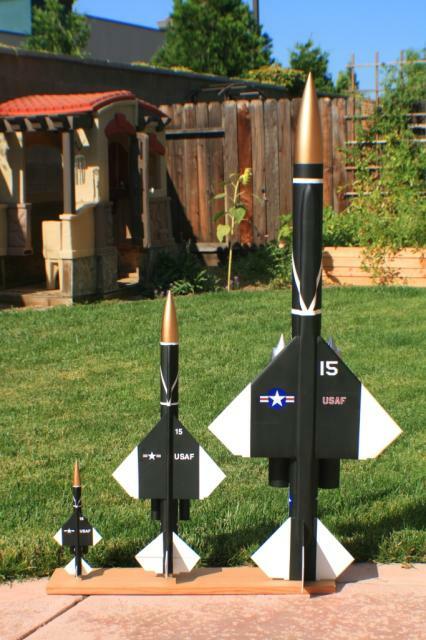 Included are the Estes Phoenix, Estes Bull-Pup, Estes Heat-Seeker, Estes Black Brant II, The Launch Pad Perseus, Scratch-built Nike-Hercules and Falcon as well as the two new latest editions  the Model Minutes Multi-Operations Missile. Red Squadron was inspired by the tv show Battlestar Galactica and these photos are of some of the clones I've built. They fly on A, B, or C motors, except the Hyper Viper that is a 4 engine cluster. They all fly and recover very well anywhere from 200' - 1000' depending on the engines being used. The Vipers are fun to build and fly. Red Squadron has flown collectively more than 20 times. There is a build article on my website www.vernarockets.com for those interested. In the summer of '07 I was on a BIG staging kick. I couldn't get enough. 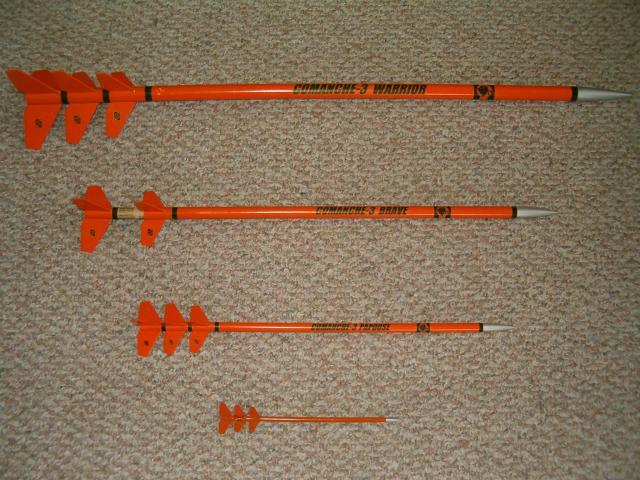 During a trip to the local hobby shop I picked up an Estes Comanche-3 kit. While building the kit I began thinking of making a minimum diameter downscale version at the same time. This was an easy decision since 18mm booster motors are readily available. 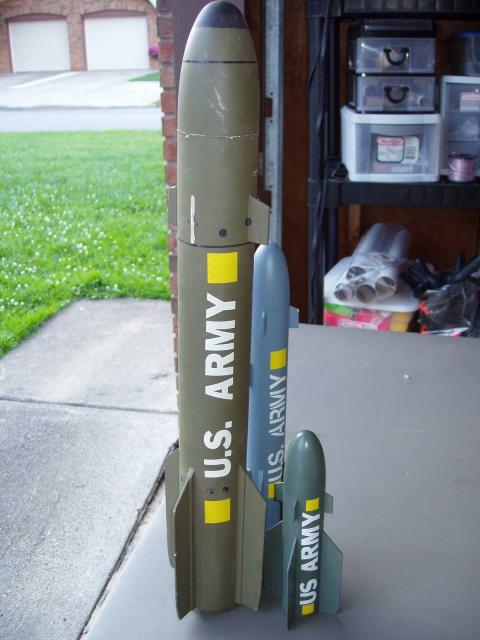 I had the proper BT-20 nose cone and of course fin stock and tubes, so I set to work. I found the Comanche-3 plans on Jim Z's site to scale down fin patterns and decals to print at home. I had to set them aside for a week while I went to NARAM 49. While there I bought some OOP Estes A3-0T and A10-0T motor packs. Can you say DOWNSCALE? You bet!! After NARAM I went back to the Comanches, only with another addition to the family. Finally, in September, during one of the last launches of the year, with the best weather for staged flights, I got the whole family, at this point, in the air. All flew great. During the day, flying 3 separate 3 stage models, and finding all 9 separate pieces with help from others, I felt very blessed by the rocket gods. Finally I have it finished. A NEW member of the Comanche-3 family. Welcome the Comanche-3 CHIEF. 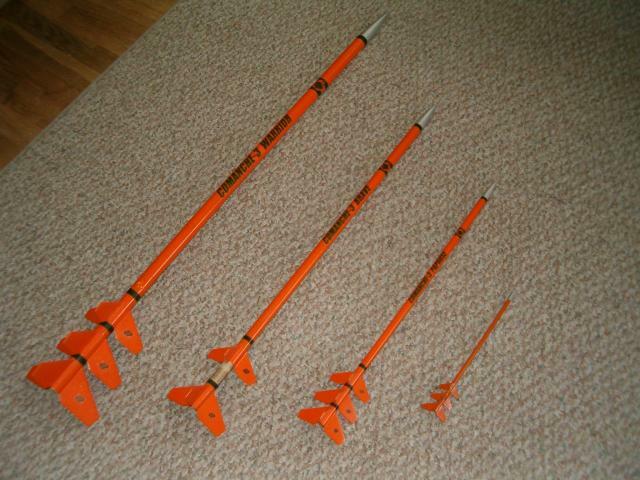 1) COMANCHE-3 WARRIOR - Estes Comanche-3 kit, flown numerous times with the HIGH ALTITUDE motor set D12-0,C6-0,C6-7. Streamer recovery, no clue on its altitude. 2) COMANCHE-3 BRAVE - BT-20 downscale, flown on a more reserved motor set of C6-0, B6-0, B4-4. On it's most recent flight I managed to loose the second stage. 4) COMANCHE-3 ITCH - BT-2.5 downscale, it's just 3 MMX motors barely taped to each other. The short delay makes it nose over a bit but it does work. I just packed the upper motor nozzles with 4F black powder using a pencil. It has only one flight. I managed to get the second stage stuck to the sustainer, which then burned the lower stage pretty badly. I'll rebuild and then put some decals on it. 5) COMANCHE-3 CHIEF - BT-55 upscale. With a Transolve P7 Altimeter with apogee ejection I won't have to worry about a chute deployment if any upper stage fails to light. 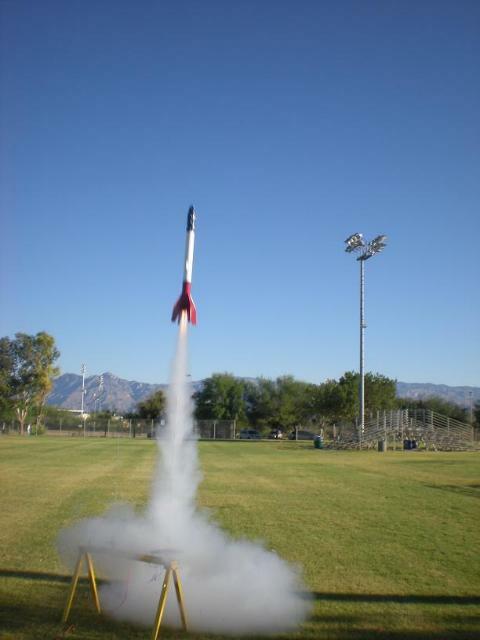 Motor choice for this rocket is D12-0, E9-P/0 and E9-6. 1) Blue - One 24mm motor mount with balsa/carbon fiber fins. 2) White with red - One 24mm motor mount with G10 fins. 3) Red - One 24mm and six 18mm motor mounts and G10 fins. 4) Yellow 4" upscale - Seven 24mm and six 18mm motor mounts with G10 fins and a fiberglass nosecone. 5) Green with white - Four 24mm motor mounts with balsa/carbon fiber fins. 6) Yellow - One 29mm motor mount with G10 fins. 7) Purple - One 18mm motor mount and is completely stock. I have one additional Fat Boy that is need of repair due to a hard recovery and it has a single 38mm mount with G10 fins. Another one that was lost in tall grass was a 24mm version with balsa/carbon fiber fins and paper/carbon fiber body tube and centering rings. Hopefully it will turn up some day to be reunited with its family. 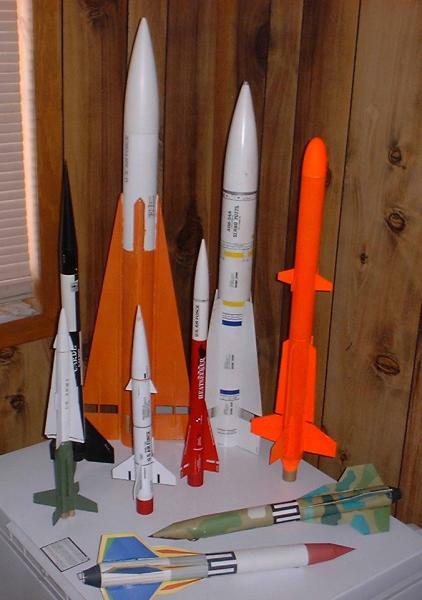 Here is my AIM-54 Phoenix guided missile family. 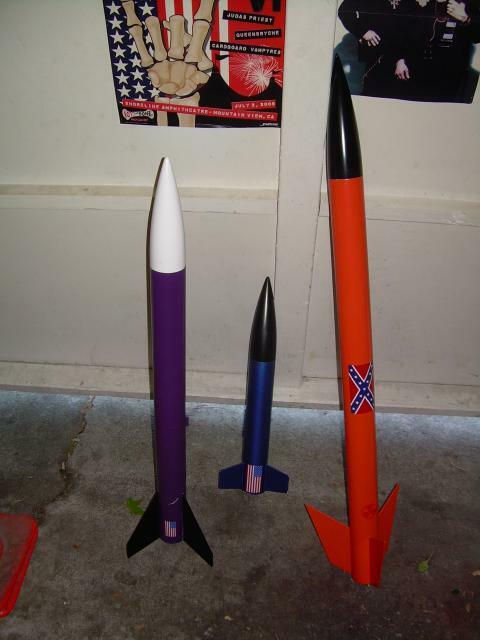 I always thought this was a cool looking rocket, I built the center one (Baby Phoenix- 24mm) as part of the last years challenge using the Estes kit as a guide as well as pictures, etc. from the internet. After building the Baby Phoenix I decided that I should actually build the Estes version (24mm). In addition, I had planned a version for the NARAM-51 Peanut scale competition (Micro Phoenix-MMX) which I just finished this week (a little late). The Estes and Micro Phoenix are both new to this family this year. Next, to join the family are a 13mm and 18mm version  sometime in the near future. 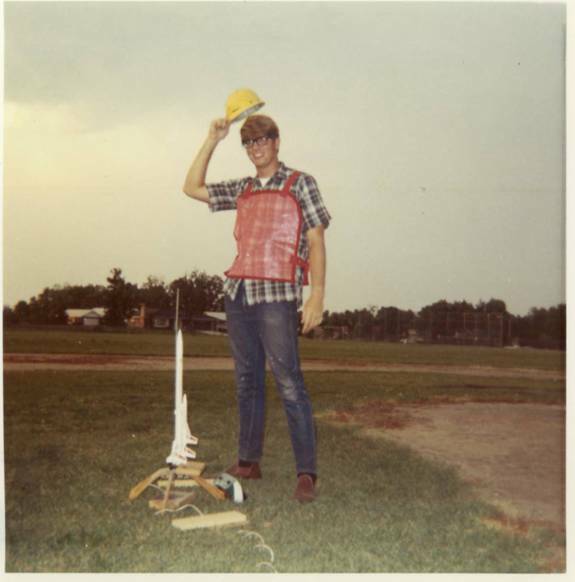 The first time I saw the Estes Red Max was 1974, My dad built one and I never did get to fly it. 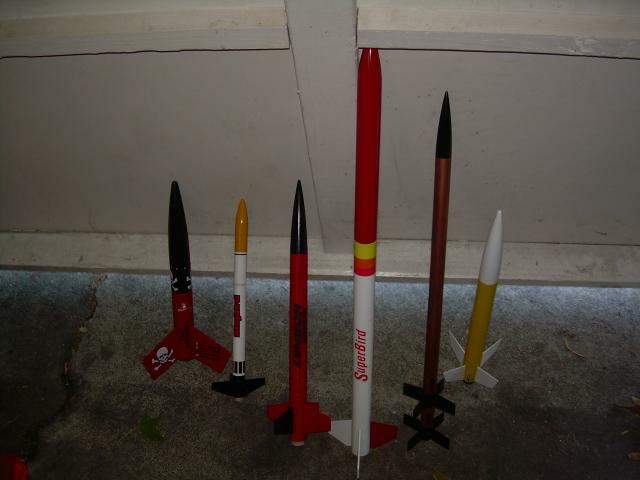 Flash froward to 2007 I decided to get back into Rocketry. I Built the Der Goony Max and also Der Big Red Max decided to rebuilt it from a extra Der red Max kit I had this year. When Estes released Der Red max I finely able to fly it 33 years later. 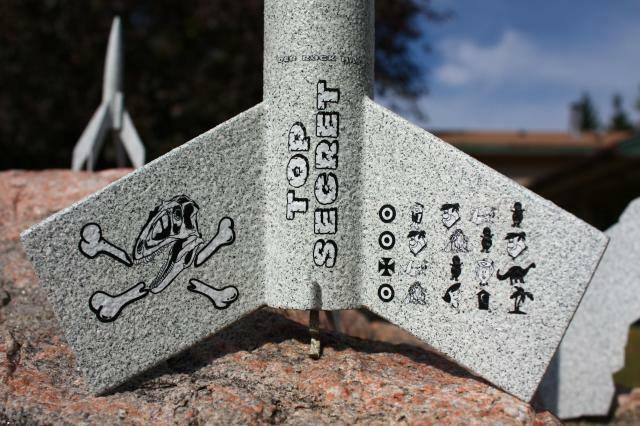 I saw decals for Der Blue Max and built that rocket later in 2007, Over the winter of 2007 and 2008 I built a 159% upscale of the Red Max one of our cats decided to take a chunk out one of the fins. Der Goony Max have flown it on A8-3,B6-4 and B4-2. 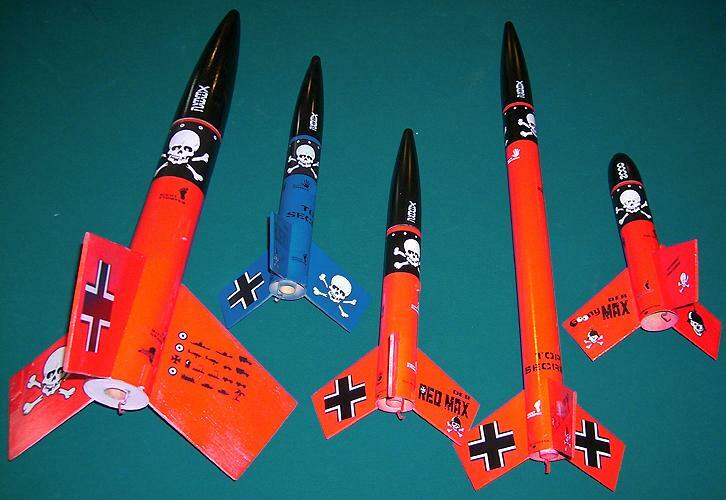 Der Red Max have flown it on B4-2 and B6-4. Der Big Red Max Have flown it on B6-4 and B6-6. Upscale of the Der Red Max have flown on D12-5. Der Blue Max, Have flown on B4-2 and B6-4. 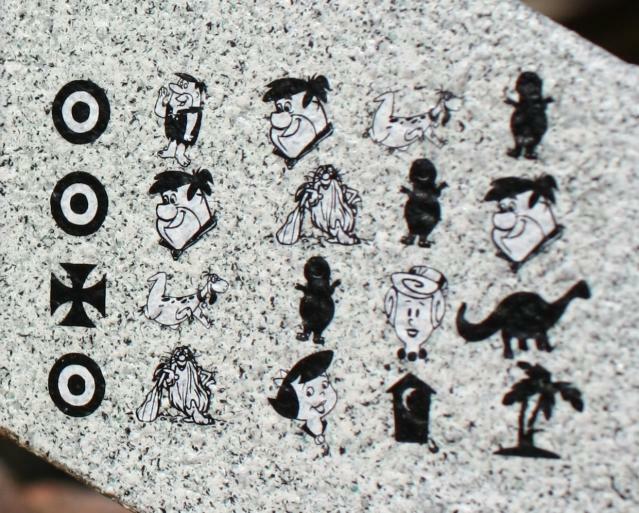 My family of rockets grew up in Bedrock. It started with the original Estes "Rock-It" which then inspired a Baby Bertha "kit bash" finished in the same faux granite finish. I stenciled and airbrushed the lettering on the free form rock like fins and the offspring was aptly named "Rock-It Baby Bertha." 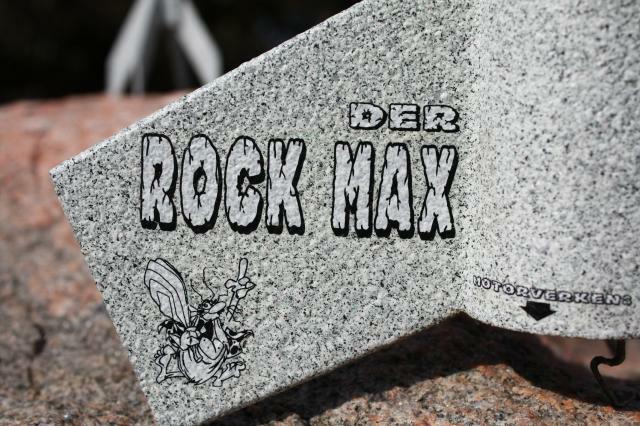 I had a battle scarred DRM that needed a face lift, so using the same granite paint, I created "Der Rock Max". Finally, a lone quark joined the family as the runt of the group, using up the last little bit of the spray can of finish. All of these have flown multiple times and have been recovered without damage. You could say they are as solid as a rock. Entry #14: Jewel Barton Butler Jr. 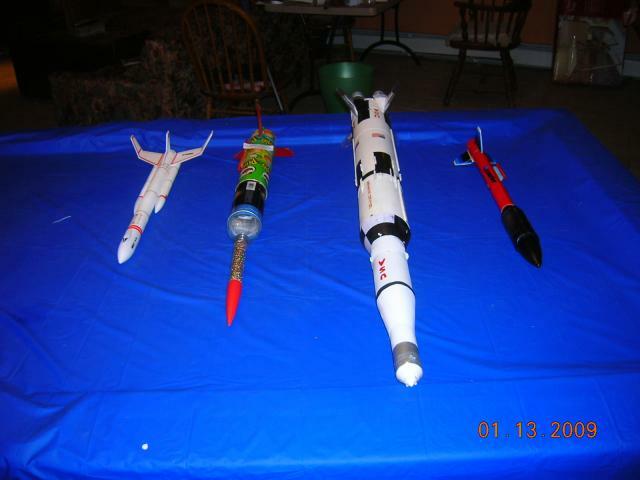 The rocket family photo contest.This family is an inspiration from the Estes Solar Flare and my love of war movies.Well I hade just finished my Upgrade of the Estes Solar Flare when . The Halls of Montezuma came on featuring Richard Widmard. fighting in the South Pacific and I took notice of some of the camo patterns .So I just added a thing or two here and there and this is what I came up with. Rocket Gangs! From the largest club launches to the backyard flyers, these gangs of young punk rockets are turning up and sowing disorder in our otherwise peaceful hobby. Typically comprised of low power rockets, these gangs find strength in numbers and show their alliance through distinctive coloring or makings. Becoming bolder and more destructive as their numbers grow many of these gangs have taken to various illicit activities such as selling black market igniters and recovery devices, usually scrounged or stolen from the range boxes of unsuspecting rocketeers. Originally nothing more than a nuisance, the increasing number of rocket gangs has led to turf wars over an ever shrinking supply of motors and range space. 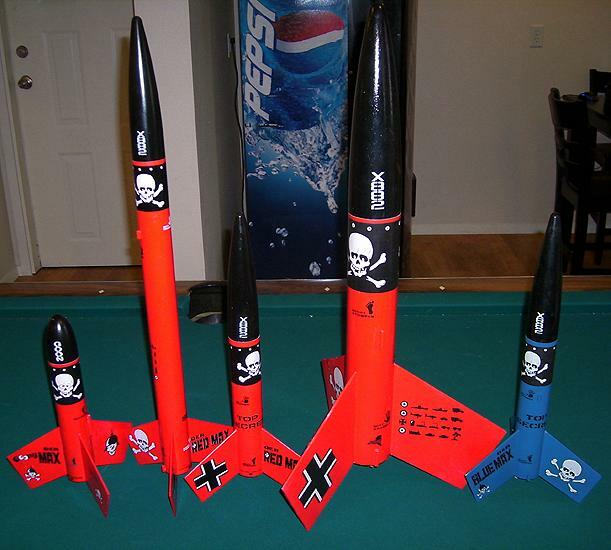 It is not uncommon to see these rockets throw down at the field, flying motors and recovery systems well beyond their capabilities in an effort to represent their colors, often with tragic results. 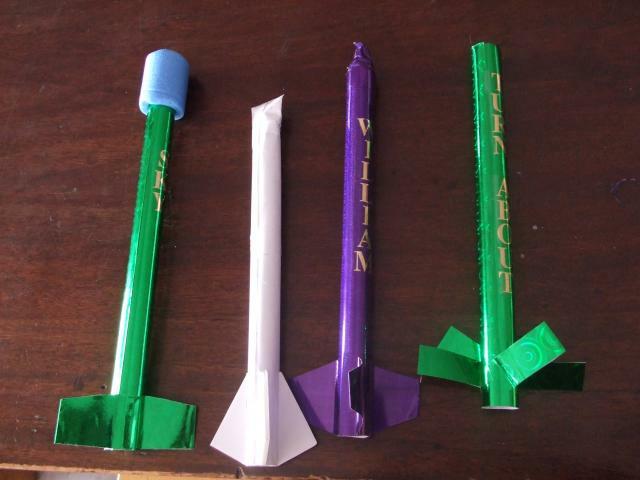 What weve seen is just the end result, the real question is, what drives these young rockets to such drastic action? The gangs shown here are from my own fleet, but the story is sadly consistent across the land. 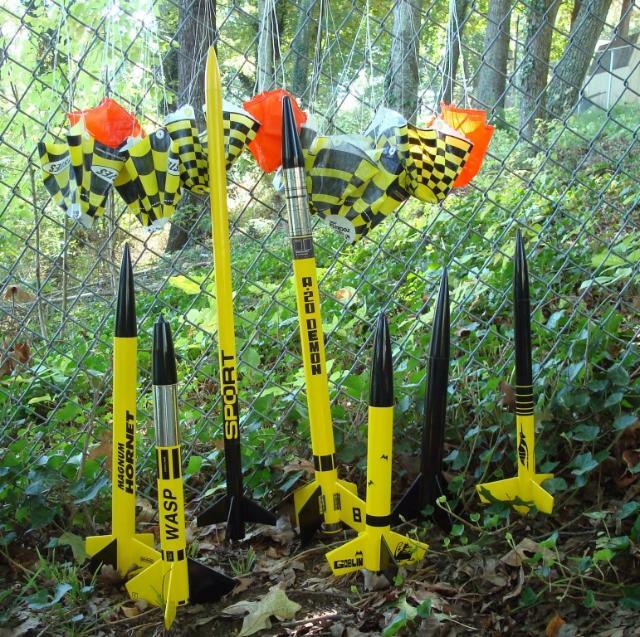 Born Again into rocketry, I dove into my re-discovered hobby with a passion and budget far greater then when I was a kid. 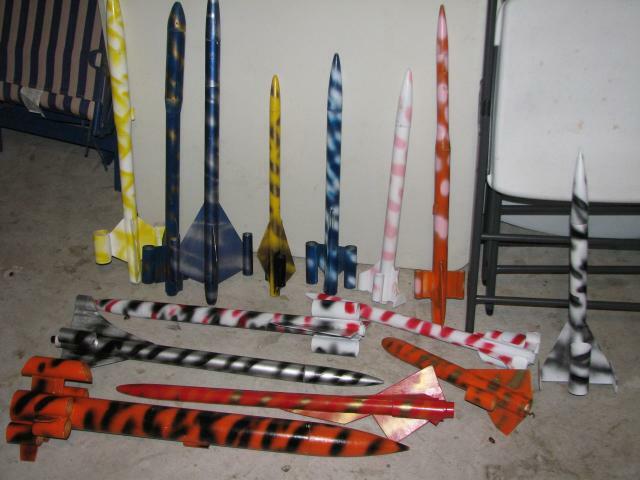 I built and flew dozens of low powered rockets, clones of my old favorites, and designs from many new vendors as well. Life was good, and then it happened. I got my L1 certification. 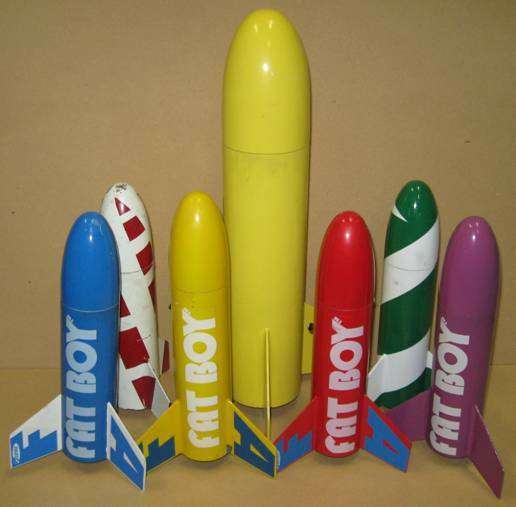 My time, my money and more importantly my attention was increasingly spent on the big boys while my low powered rockets sat un-flown on the shelves. Sure I still took them to the range, but more and more they got left in the car, and the ones that did get to fly got tossed up to check the winds. Eventually most of them were simply left at home. 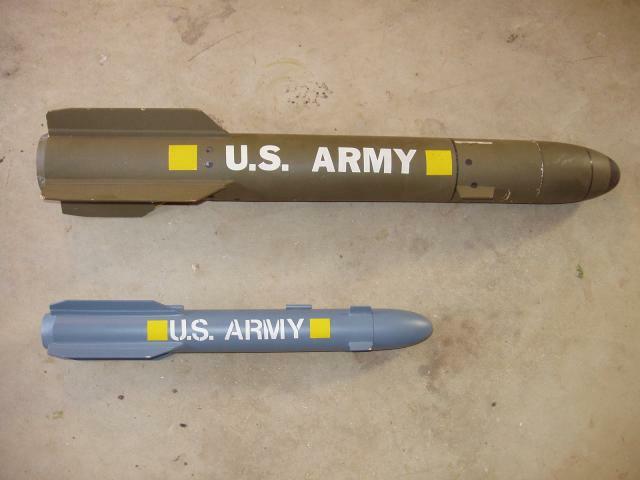 On their own, these low power rockets banded together out of necessity, and created their own version of range brotherhood. 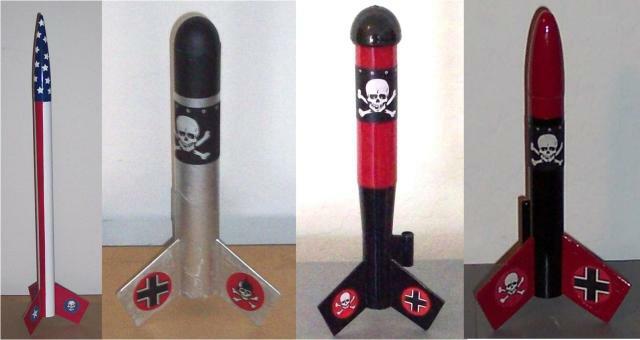 Most of these rockets are good flyers gone bad, low power kids trying to survive in a high power world. My friends it is up to us to stop the slide that many of our low power rockets have begun. 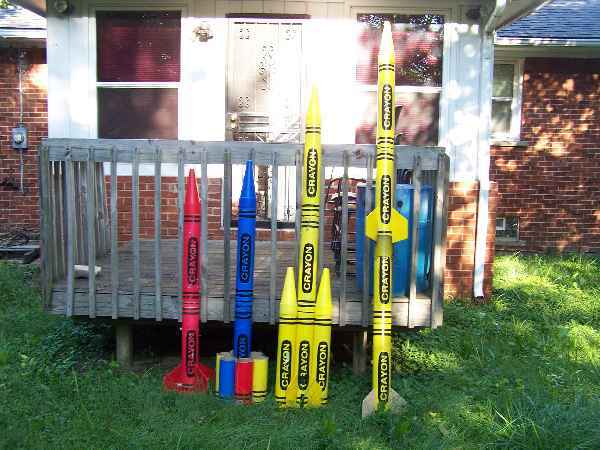 There is more to being a BAR then just building bigger rockets and spending more money. We also bear the responsibility of caring for what we create. Every rocket needs to fly and we must give them that chance. BT-55 downscale of the Der Big Red Max  this one I called the Big Red White and Blue Max. Hindsight shows that the E9-8 on that windy day was not the right motor. Der Silver Max. Salvaged from a build with some Scouts, this 18mm version made from a paper towel tube was stepped on by an overzealous 7 year old chaser. I told him to keep it. BT-20 to BT-50 variant. Landed in an irretrievable location. BT-20 Mini Red Max. I let one of my boys carry this from the car to the field and somehow it disappeared in between. Flew great on 13mm motors before the loss. After getting back into the hobby, I discovered cloning. These four family Goblins were not built from commercial kits. My first attempt was an all time favorite - The Goblin. It was built stock, around the BT-55 airframe. All parts were ordered through Semroc. The plans were from Jim Zs site and the decals from Excelsior. It has flown many times on B6-4s and C6-5s. Back in the 1970s I lost my original Goblin on a D13, I havent gotten the nerve to fly the clone on a D11. My BIG Goblin is a 1.7 upscale. It was the first big model Id built since the Enerjet days. The body tube is the Semroc heavy duty 225 tubing. Through the wall basswood fins, and that big, beautiful BD-25588 nose cone. The engine mount is made for 24mm engines. Recovery includes a baffle and a 24" rip-stop nylon parachute. I know (now) there are available kitted upscales of the Goblin, but this one was upscaled and built from parts. 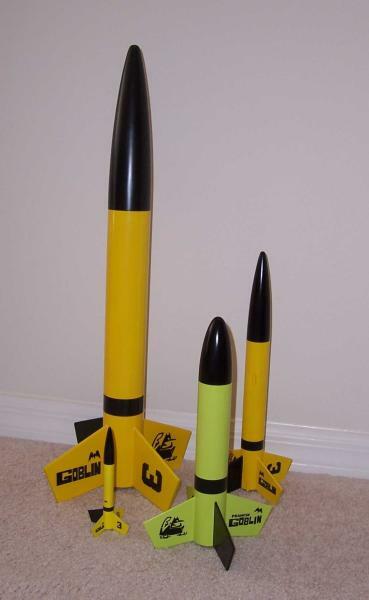 My Baby Goblin is a carded model from the Rocketry Blog website: http://rocketry.wordpress.com/ultimate-paper-rocket-guide/paper-rocket-partial-builds/ All parts were printed on 110 lb. Cardstock. 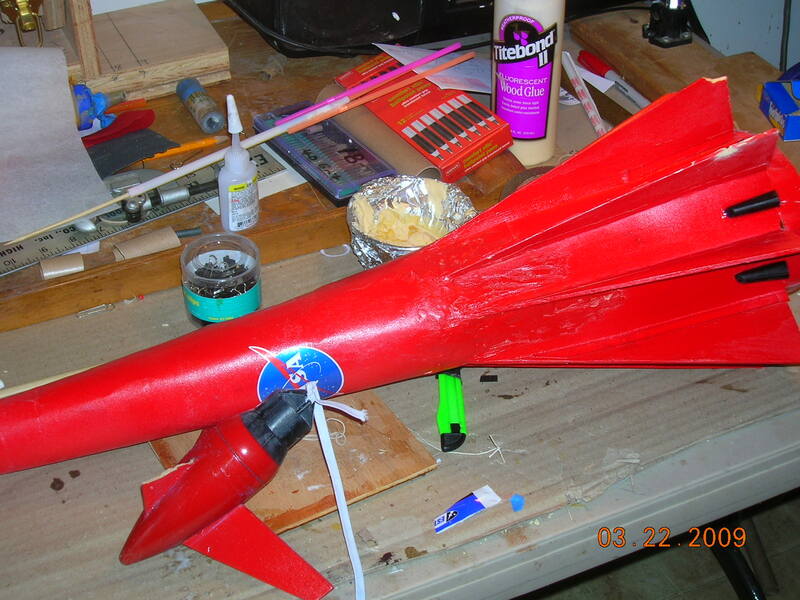 The nose cone is balsa and a small streamer is used for recovery. 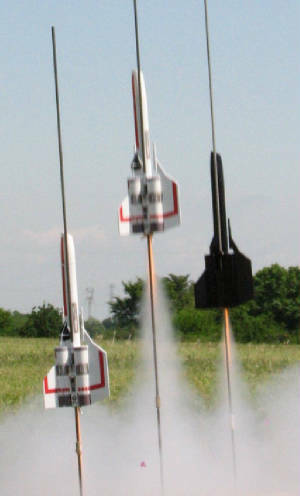 It has flown using Quest Micro-Maxx engines. Just added is my new fleet favorite, The Franken Goblin! This model was built and flown as The New Member of the Family for the 2009 EMRR Challenge. The economy dictated which parts were available, anything and everything already in my spare parts box. From existing and retired models, I pulled and cut-away enough parts to piece together the monster! The mainframe is 8 ½" of BT-60. A Goony? Well, sort of - but just a little scarier. Id bought decal paper but hadnt used it yet. This model cried out for a revised Goblin treatment. Overall, I was happy with my first attempt at decals. The green and black paint decor suits the Frankenstein theme. A stable, fun and reliable flyer, B6-4 engines are a great fit. 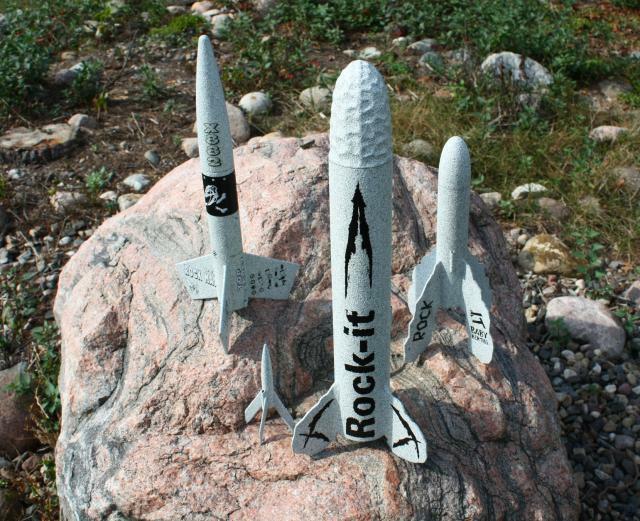 For the Rocket Family Photo Contest, I decided that I would add one rocket that could belong to two of my favorite rocket families. Those two families are the Thunder-series and anything Goony. What better way is there to link the families together than with the ThunderGoon. 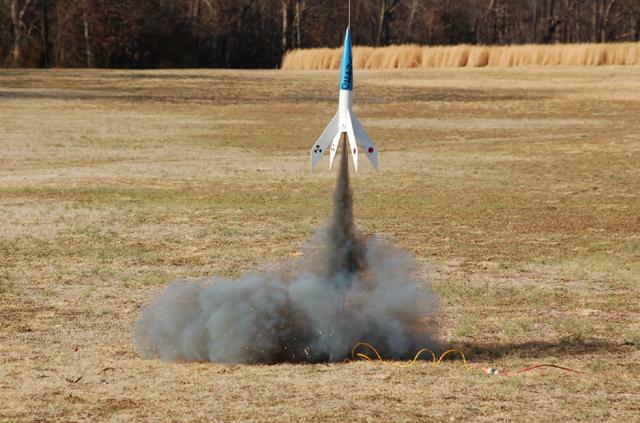 The rocket is a kit bash from a Baby Bertha kit that has the nose cone replaced with a BNC-60NA from Semroc. I designed the decals and printed them onto laser decal paper (I wish I had color). 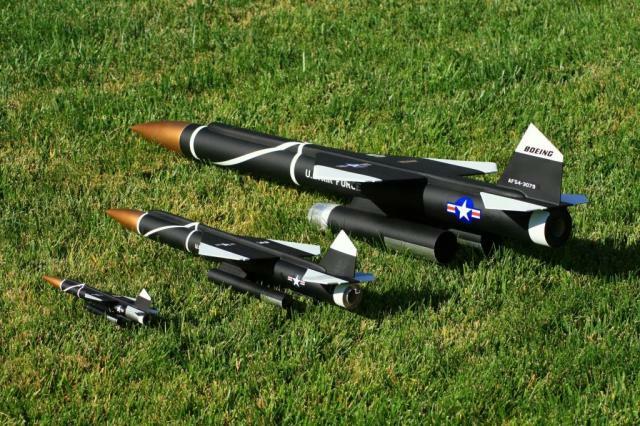 The rest of the "Thunder" family (ThunderBee, ThunderChief, ThunderHawk, ThunderBird, ThunderRoc) were created from kits and parts that I picked up at Semroc. The ThunderStrike will be added as soon as it gets painted. 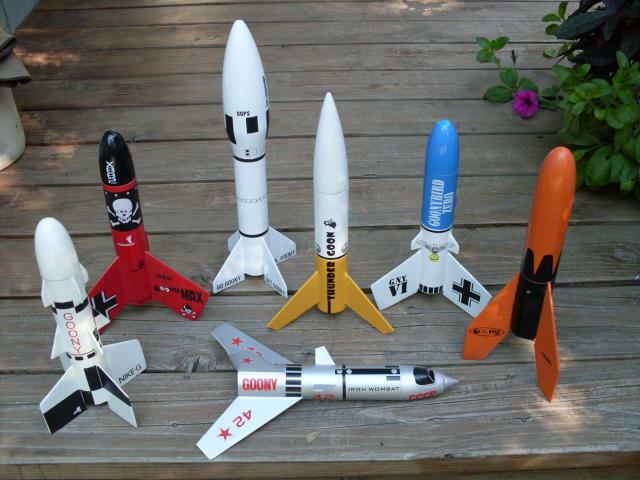 The Goony family consist of Goony Retro-Bash decal/plansets from Excelsior Rocketry with the exception of the ThunderGoon. Current members of that family include Goony Max, Honest Goon, Kram, Iron Wombat, Goonybird Zero, and Nike-G. 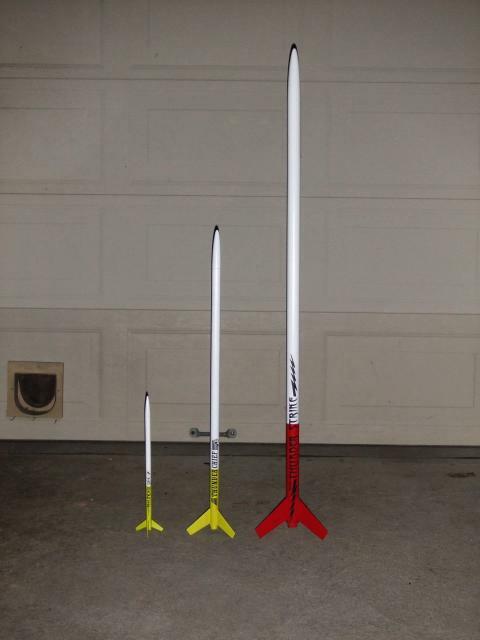 This family will be growing with more decals & plansets from Excelsior plus some really cool designs floating around on The Rocketry Forum. Turnup Also scratch built using plans off the internet. NARTREK also supplies this plan with the Silver Level materials. I have placed in NAR competitions with this design. * Semroc Nighthawk My most recent addition. I also reviewed this recently. I love this glider. Very light for how big it is, large wing area, great glides. A note about the Turnup glider. The one pictured is my third. This is a very good glider design. My first two flew too well and spiraled away never to be seen again. The last one was last seen gaining altitude on its way out to sea. This is the one I prefer to use in competition for 1/2A and A boosts. The pod shown is my 13mm pod. I also have an 18mm pod. I still need to replace the one that went to sea, because the one shown has a spruce boom, which is strong but adds too much weight compared to the recommended hard balsa. It is not competition-ready. 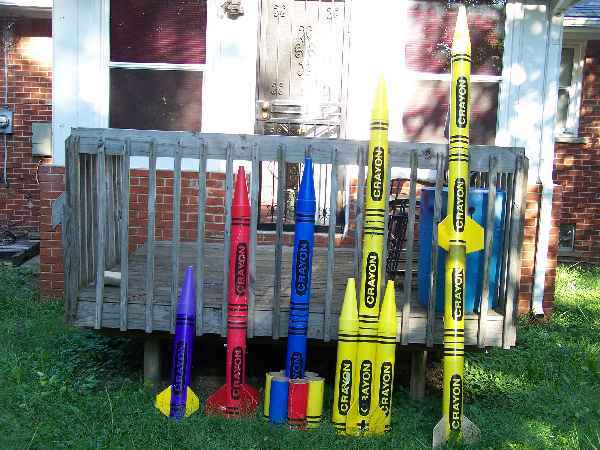 When I first decided to enter this contest, I was going to use my four helicopter rockets, then my four camo paint rockets. But after a closer inventory was taken, I discovered that the short and stubby account for a much larger portion of my fleet with greater variety. They are also more photogenic. I'm a big fan of rockets that provide a short walk for recovery and/or an unusual flight. So here they are, in all their splendor! Estes Baby Bertha - Outstanding on a B6-4. Loc/Precision Warlok - Aerotech I284-6W (I certified level 1 with this rocket when it had just two coats of primer). Scratch built 7.5" dia. 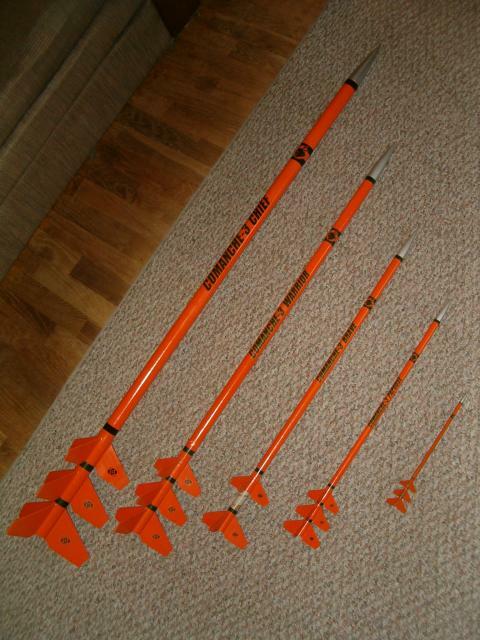 spool rocket - Aerotech G40-4W - 300 ft. (I consulted every EMRR spool rocket article I could find to build it). Mod of an Art Applewhite Stealth - 29mm - Spins like mad on the way up, spins slow on the way down. The ever popular Estes Fat Boy - 18mm. Square spool rocket - 18mm - Yes SQUARE, and it flies fine. "Tiny" 3FNC - C6-3 - disappears off pad. 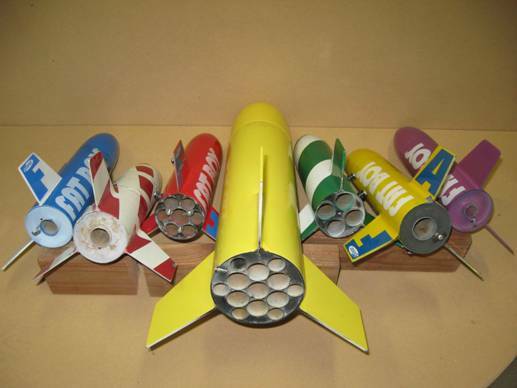 Five Art Applewhite inspired paper rockets with St. Louis Rocketry Association logo - A10-PT - Great little fliers for cheap! 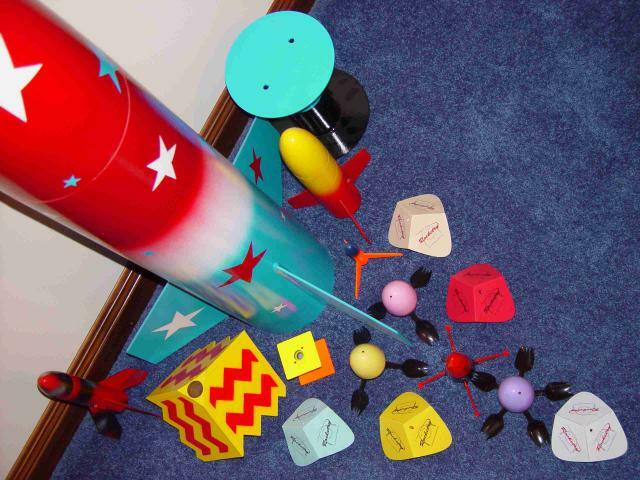 Three egg and spork rockets - A10-PT - Spin like mad going up, autorotation recovery (purple is 18mm). Estes Mini Marz Lander - A10-3T - Flew once, very low apogee, deployed fine. Now I just like to look at it. 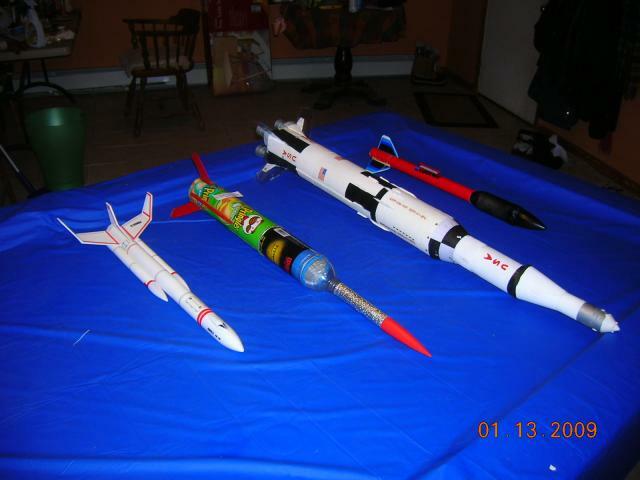 My entry for the family contest is a family of air pressure rockets made by myself and a group of cadets that I took for a rocketry sessions during our inspection day. The pupils where given basic information on the design and then made their own, the session finished by then using their rockets to spot land on a target 100 meters away, - I was the target! There was a range of styles, including rotated fins, tube fins, differing lengths etc. 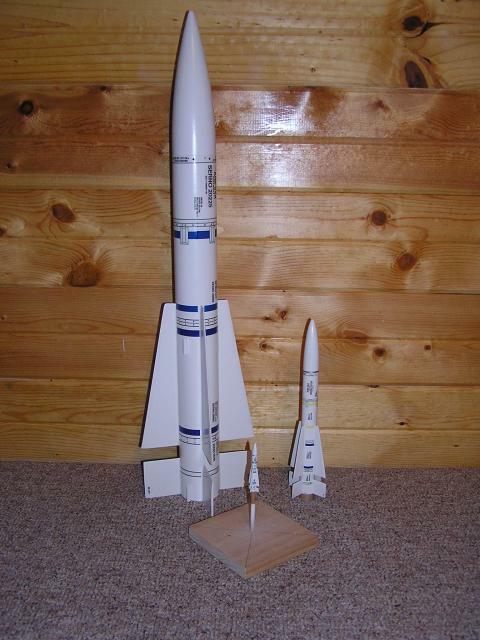 My Rocket Family consists of the original Estes Orbital Transport as shown in the photograph taken 40 years ago and the latest 4x Scale Estes Orbital Transport taken in July 2009. In that time I have grown a lot older and the Orbital Transport has grown a lot larger. Originally, the Estes Orbital Transport was 18 inches in length. The scaled up version is 72 inches in length and has an orbiter that Remote/Controlled. Here we go. from left to right. MILITARY FAMILY.1). 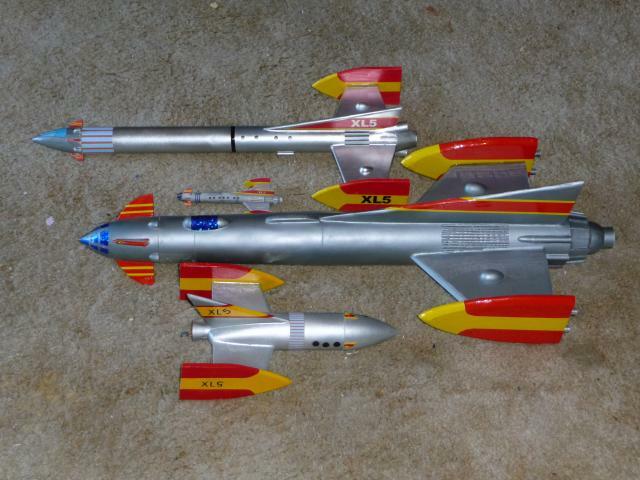 Estes Stormcaster,my first big Rocket. Flies on D's. 2). Estes U.S. Army Patriot.Build kit not rtf. Screams on a C-6-5. 3). Estes D-Region Tomohawk. Built to fly on Composites but an E-9-6 Rocks. 4).Estes Guardian. One of my best fliers. 5). 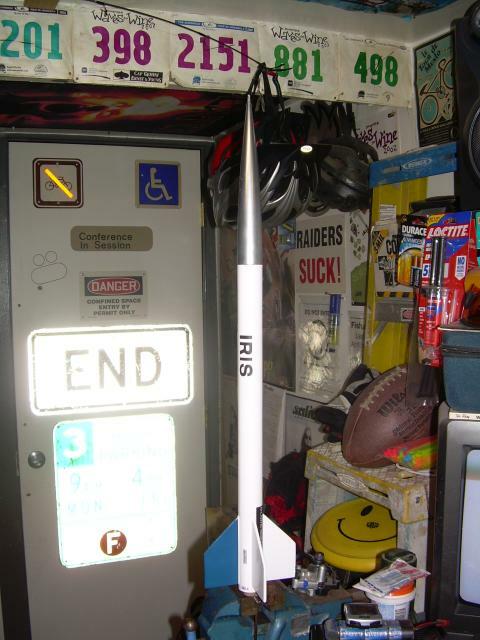 Estes Eliminator.One of my workhorses always first on Launch Day. Screams on E's. FAT BOYS. 1). Estes Executioner. ttw fins to fly on Composites. Technically it is my Wifes. 2). Vaughn Brothers Stretch Blobbo. This thing is a Beast. 3). Dynastar Grappler. The General Lee. Flies on E-15-7,s Always a perfect slow straight flight. RETRO REPROS. 1).Estes Der Red Max. She,s a real spinner. 2). Custom Rockets Skybird. Fast as Heck. C-6-5. 3). Semroc Magnum Hornet. Tweaked to handle D's and E's. FAST ! 4). Quest Superbird. Flys like an Arrow. 5). Estes Mongoose. My first two stager.C-6-0 to a C-6-5 = C YAH ! 6). Estes Cosmic Cobra. Re-Painted after my Dad found it in the Garage after 20 Years. NEW MEMBER OF FAMILY. 1). Semroc ISIS. Super fast and Dependable. LOW POWER . 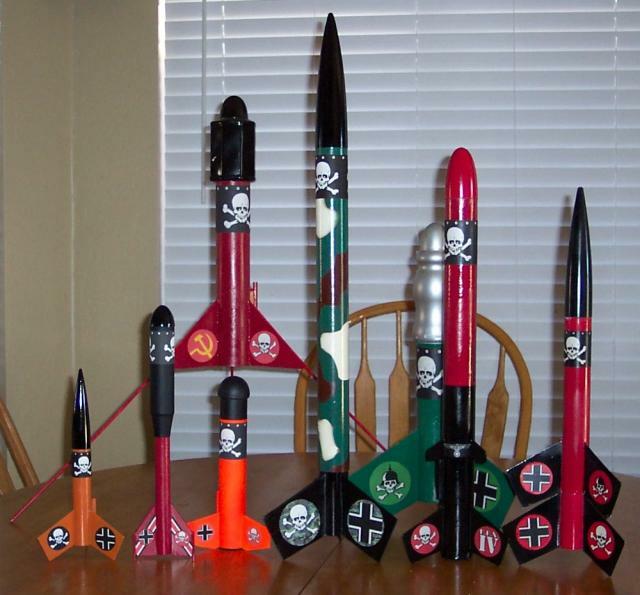 1).Custom Rockets Evil One. 2). Estes Chrome Dome. 3). Estes Baby Bertha. 4).Estes Astron Outlaw. 5). Estes Blue Ninja. 6). Quest Ruthless. 7). 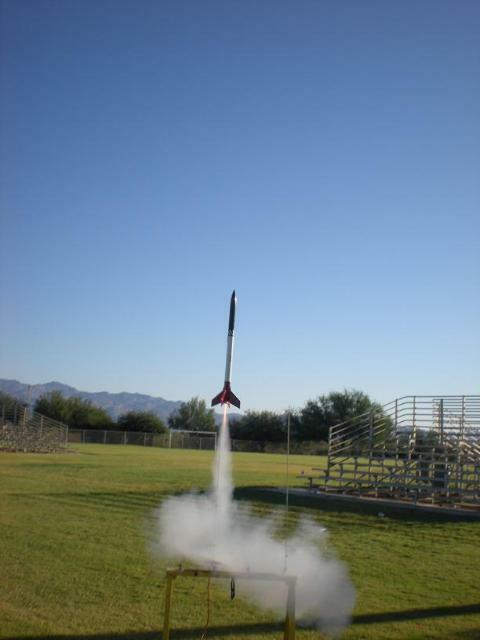 Estes Astron Outlaw. 8). Custom Rockets Box of Parts. All fly on C's I dont use anything less than a C, EVER ! 29 MM MID POWER 1).Loc/Precision Stretch Aura. Completely re-built after a Crash. Going for a Mile at Snow Ranch this Winter. 2). Aerotech IQSY Tomohawk. This is my Favorite in the collection. Always gets appluase. Fast and straight. 3). Loc Precision Lil' Nuke. Lives up to it's name. E-30-4 is wicked fast can't wit to fly her on G's.70 percent of the fleet is using Nomex Shield and Nylon Chutes with Kevlar Shockcord. The one on the left is my long since retired TLP Hellfire. The second, blue Hellfire is scratch built. It is based on measurements I took at an air show of one mounted to an Apache Helicopter. These two married and gave birth to the Hellion, who is the newest member of the family. There was also a minimum diameter 24mm version no longer with us, R.I.P. Enclosed are a few pictures of my "repaired fleet." Mr Pringles was built with all recycled items except the new "nose cone" and body extension I got from another kit. Saturn V was a repair job w/ separation in middle, (about 8" from tip). This was done to allow quicker deployment of over 60" of parachutes. I took a standard "Courier" and extended the nose cone to accomondate two eggs from a mailing tube. Added the repair of the Jupiter II used for the Design this Spaceship contest. The Thunderbee is one of may favorite 13mm models--long, sleek, relatively high performance flyer--so when Semroc announced two more members of the family were coming out this summer, I jumped at the opportunity to adopt the bigger brothers of the tine little Bee. 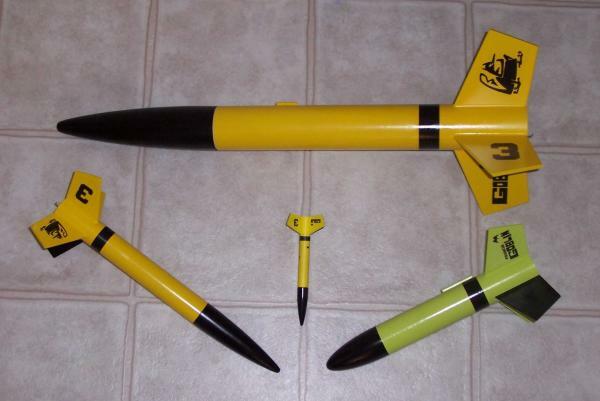 The Thunder Chief is a little over 18mm diameter, and finished in the same Day-Glo yellow and white scheme. 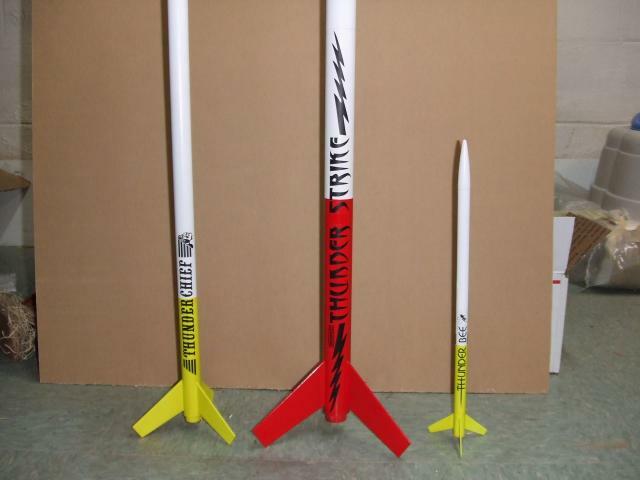 The much taller Thunder Strike flies on 24mm motors and is a whopping 51" tall. Believe it or not, though, these are still the juniors in the family. Planned for future releases are the 42" Thunder Bird, falling somewhere between the Chief and the Strike and the 60" Thunder Roc. I can only hope that this family's Christmas portrait will include a few new arrivals. 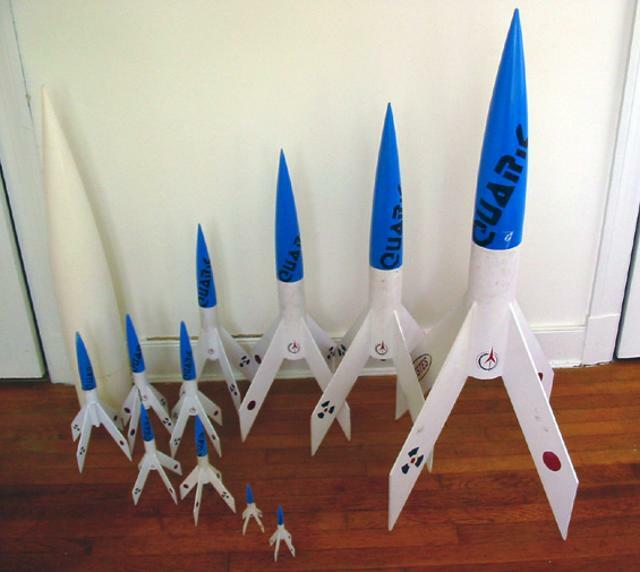 I am a big fan of Semroc rockets. 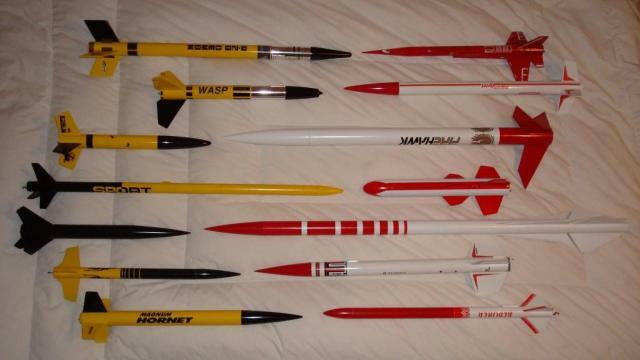 Many of my favorite rockets come from their vast offering of rockets. I especially like their scale, SLS and Retro-Repro lines. 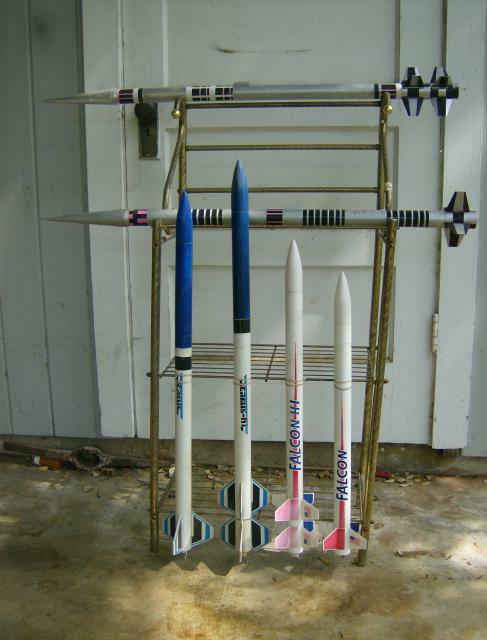 One of my favorite rockets and the first Semroc kit I built is the Semroc SLS Aero-Dart. This is just an awesome rocket all around. Very solid, high quality parts throughout. We have flown it on a variety of 24mm motors. I highly recommend this rocket. 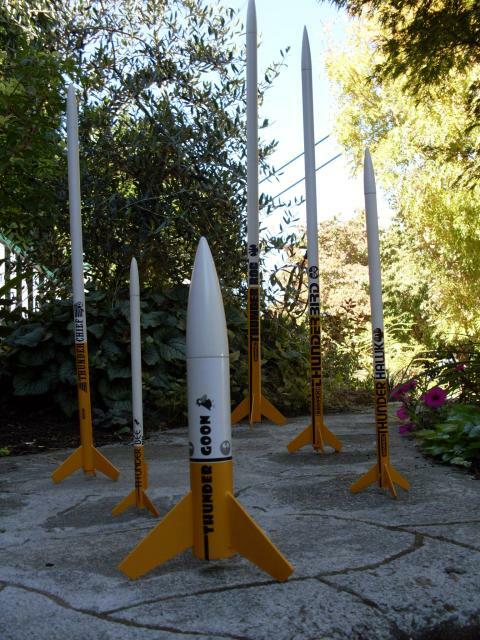 All the Semroc rockets I have built have flown fantastic. 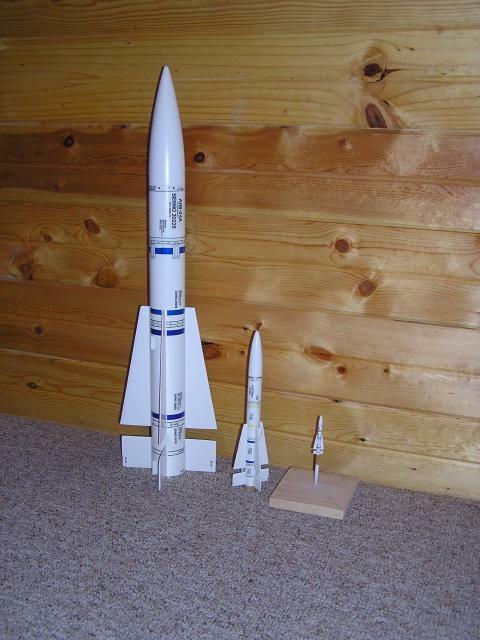 They are some of the highest quality kits I have built and would highly recommend building some yourself, especially any of the SLS kits or the Saturn 1B. I am anxiously awaiting their Saturn V that is soon to be released!